A waltz in honour of the sweet, sad, tender joy of the close of something. I love this poignant track. Beautiful, spacious, acoustic piano and cello music. A journey through 2 waves of energy. Suitable for dancing, meditating, massage and moments in time and space. Tracks: 1 First Light, 2 Valour, 3 Delirium, 4 Twilight 5 Vigil, 6 Dark Earth, 7 Arising, 8 Eerie Elves, 9 Eerie Cellos, 10 Homecoming, 11 Still Dancing. 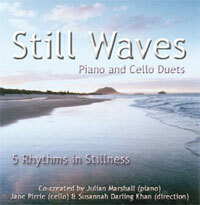 "I am deeply moved by "Still Waves". It is chamber music to ignite the Spirit." Marius-Christian Burcea, host and producer of radio show in Bucharest, Rumania.